This past June, I arrived at our local game club, the Norwin Game Knights, prepared to run the second act of +Harley Stroh's Tower of the Black Pearl. 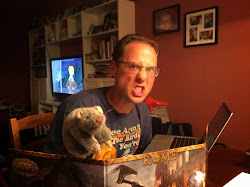 But when I saw that we had an overwhelming number of brand new players, many looking to try Dungeon Crawl Classics for the first time, I chose to run an introductory, 0-level funnel instead. The only problem, was that I didn't come prepared with a 0-level funnel! Thinking fast, I started asking our group of players questions, and listened to them shout out words and ideas. From this live-action "Mad Lib" activity, we collaboratively came up with the very first draft of Centi-goats of Centaurus 7. You can read all about our antics by following this link. As the weeks have gone by, I've had an itch to further develop that crazy session into a more concrete adventure. I must say, I was further inspired when one of my players, +Evan Blenko, created some custom cover art for the adventure (seriously, you need to check it out!) So I put some more notes down on paper, and started looking for further inspiration. 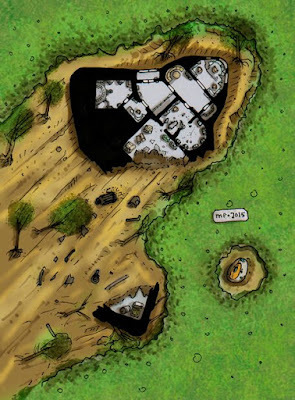 I found an incredible map on my friend +Miska Fredman's Patreon page that could serve as the perfect "crash site" for a sci-fi horror based adventure. My daughter +Carina W., ever the artist, offered to help with a picture of the dreaded Centi-goat monstrosity. Everything just came together. So I give you Centigoats of Centaurus VII. If you're ever looking for a somewhat bizarre, way too far over-the-top, sci-fi based 0-level funnel, this could be just what you are looking for... and more! If you do happen to use this adventure in your own games, please let me know and share your stories! Contestants of a futuristic game show must fight to survive and escape the dreaded jungle planet Centaurus VII while being hunted by the most fearsome goat-like creatures to curse the space lanes. Goats have been a running gag in our local game club's DCC adventures ever since one of our players found out that his Crawling Under a Broken Moon 0-level character had a headless goat as a piece of equipment. I was further subconsciously influenced to pursue this idea by the outlandish computer game Goat Simulator. More serious inspiration can be found in movies like Aliens, Predator, Aliens vs. Predator, and any terrible, B-movie variant of those films. Connections to the TV show Survivor are also obvious. Before embarking on this grand voyage to a world of sadistic and evil centigoats, you may want to check out a few other resources. Miska Fredman's Patreon Page - The snapshot of the shuttle crash map came directly from +Miska Fredman, and is shared on this page with his permission. That said, if you become one of Miska's patrons, you can access all kinds of phenomenal maps. I'm a proud patron, and the Crash Site series comes with multiple maps: black and white, color, nighttime, and an adventure seed. Crawling Under a Broken Moon Issue 2 - The mutation canisters found in this adventure cause PC's to develop strange and sometimes terrifying powers. For the purposes of this adventure, I'd recommend using the Base Mutation Table found in the CUaBM Mutant class in this particular zine issue. Space Dungeon Occupations - Created and compiled by +Noah Stevens, this list is PHENOMENAL and fits the tone and feel of this adventure perfectly. While you can certainly throw any 0-level characters into this adventure, I highly recommend going the full sci-fi route. You can even choose to use the 0-level generator on the Purple Sorcerer's site. Just select "Space Dungeon (Stevens)" for "Occupation Source." Centigoats of Centaurus VII is a 0-level funnel for 12-18 PC's. Alternatively, this could be played with 4-6 1st level DCC PC's, with a whole lot of re-skinning given the "sci-fi" feel. If you are using either Crawling Under a Broken Moon or Crawljammer as a campaign setting, you can probably make this fit fairly easily.. It is the year 2250, and the player characters (PC's) are participants in an incredibly popular reality holo-show called Offworlders. After nearly two-hundred and thirty-three years since the decline of the reality TV show, some rich producers thought to resurrect the genre so popular in the late 20th and early 21st century. Offworlders drops contestants off on remote, alien worlds, to survive for thirty days. Of course there are some safety precautions on the Offworlders holo-show. Producers make sure that the participants are protected by a great electric fence, creating a secure perimeter and enclave. The participants may have to deal with nuisance creatures, such as bugs, worms, and slimes, but the most dangerous alien life forms are safely kept at bay. This season's episode of Offworlders takes place on Centaurus VII. A hot jungle world roughly the size of Venus, Centaurus VII was viewed by producers as being quite uncomfortable (and therefore good for holo viewers), but not particularly dangerous so long as the Centaurian Gorekillaz were removed from the holo-show's protective enclave. The producers know nothing of the Centigoat threat. Unfortunately, this season's holo-show is about to get off to a rocky start. Crash! - The adventure begins with a great crash, as the PC's are ejected from their cryopods onto the floor. It should be revealed that they are all contestants on Offworlders, and that they are expecting to land at a drop zone within a somewhat safe, definitely not mortally dangerous, jungle enclave. But as the PC's get their bearings, they will notice that their shuttle is a wreck, with pieces of the ship on fire, exposed wires sending sparks, and smoke filling the craft. How the shuttle crashed is up to the judge. Maybe it was just a bad day for the pilot, or perhaps poor weather forced the craft down. Exploring the Shuttle - Surviving this adventure will require that the 0-level characters salvage as much as possible from the crashed shuttle. Give the players enough detail about the damaged shuttle that they feel risk of staying inside, but also give them time to explore. There are Gorekillaz waiting outside, and they should start to enter the shuttle's broken frame at some point. Cryopod Room: This is the starting point for the adventure. A semi-circle of six pods, each capable of holding 2-3 participants. Whatever the 0-level characters have as starting equipment is found in small footlockers kept at the base of each cryopod. Each cryopod has its own battery unit, and can be reactivated with an Intelligence check (DC 15). Someone placed inside the pod can be kept "on ice" for 3d6 months before the battery runs out. Med Lab: The Med Lab is directly adjacent to the Cryopod Room. Most of the supplies have been strewn about, but the PC's can recover 2 medkits (heals 1d4 hp), 1 stim-jim (boosts Strength by 4 for 2 hours before dropping it by 8 for 4 hours), and 2 gallons of fresh water. There are also 3 Mutation Canisters designed to help survivors adapt to different worlds. Unfortunately they don't work well! PC's who open a canister are exposed to enough mutagens that they suffer a mutation as per the Base Mutation Table found in the Crawling Under a Broken Moon Mutant class. Alternatively, you could come up with your own mutation, perhaps raising an attribute at the expense of another, or just making cosmetic changes. Each Mutation Canister has only one use. Command Deck: PC's approaching the command deck of the crashed shuttle can feel the heat coming off the door. The fire burning on the Command Deck has ruined all electronics and controls. Attempting to enter the deck causes 2d8 damage per round to a PC, and allows the fire to spread to the next chamber. Airlock: 2 EVA suits can be found in the Airlock. Although designed for space travel, the suits provide some additional protection (+4 AC, Fumble Die 1d8), and render the wearer practically immune to background radiation damage. Given the hot jungle temperature, however, wearing the suit for longer than an hour requires a Fortitude save (DC 10) for each half-hour of use. Should a PC fail the save, they suffer 1d4 points of Stamina damage. If this forces their HP below 1, they die from heat exhaustion. This damage can be recovered at a rate of 1 per hour, or 1 per minute for every gallon of water used to cool down. Port Drive Core: The port drive core compartment is stable, but shut down. Attempting to power up the drive core is impossible due to the condition on the Command Deck. There is a toolkit in this room that may come in handy later, however. Cargo Bay: The cargo bay is directly exposed to the exterior of the crash site, and most of the contents are damaged. When the Gorekillaz decide to enter the shuttle, it will be through this breach. But searching the chamber the PC's can salvage the following: 2 Pulse Rifles, 11 chips of Pulse Rifle ammo, 1 Flamethrower, 5 chips of Flamethrower ammo, 20' of useful rope, a crowbar, 2 flashlights, 5 MRE's (meals ready to eat), a professional quality video recording rig, 1 small tent, 2 metal crutches, and a single foam mattress. The Crash Site - The actual crash site is fairly dangerous. As the PC's start to search the Cargo Bay, give them indications that "something" is coming. Alternatively, if the PC's are exploring every nook and cranny of the crashed shuttle, and are unfazed by the flames and sparks, send in the Gorekillaz. Gorekillaz: 5 Gorekillaz enter the cargo bay swiftly, and with extreme prejudice towards the Earthlings. Cargo Bay Fragment: South of the main crash site the PC's come across another section of the shuttle. This was part of the cargo bay, and searching the containers the PC's can find 2 more chips of Pulse Rifle ammo and a container of super-chunky peanut butter. C.H.O.P.A. #1 - The Courtesy Helium Operated Passenger Assent vehicle is designed to give contestants a quick and easy escape from the holo-show. Up to six contestants can comfortably fit inside a CHOPA, as it automatically fills a great helium balloon and floats high into the atmosphere for retrieval. Unfortunately CHOPA #1 has been damaged, and is lacking a Helium Module. It seems that several inquisitive Gorekillaz have found this module, and are playing with it off in the jungle nearby. CHOPA #1 has a very clear "#1" stenciled on the side of the craft, leaving it open that there is a CHOPA #2 located somewhere. A single Flamethrower (4 chips of ammo) is contained within a special housing on the outside of the CHOPA. High Pitched Gorekillaz: The PC's hear the laughter of two nearby Gorekillaz that have taken the Helium Module off of the CHOPA and are breathing the gas. Unfortunately for the Gorekillaz, a Centigoat lurks! If the PC's follow the sound, they discover the pair of creatures 100' to the east. 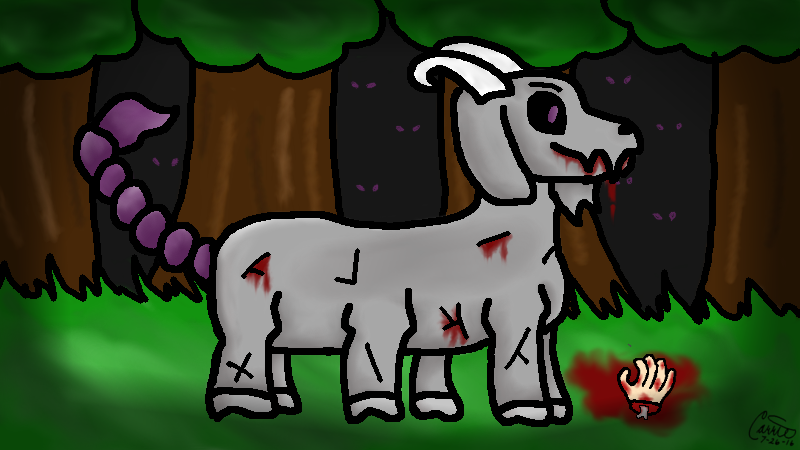 The First Centigoat: This encounter should occur whether or not the PC's follow the Gorekillaz. If they do follow the crazy, high pitched laughter, a lone Centigoat appears and quickly stings both Gorekillaz. The brutish apes fall over and start to transform into Centigoats. If the Centigoat notices the PC's, it attacks. If the PC's don't follow the Gorekillaz, they hear the laughter quickly stop, and a few rounds later the Centigoat attacks the PC with the lowest Luck score. The Jungle - Any trip into the jungle itself should result in one of the following encounters. For each hour exploring (perhaps searching for CHOPA #2), roll 1d7, and refer to following list. If the PC's are not following some kind of path or trail, feel free to repeat these encounters, obviously keeping in mind previous actions. Bob the Production Assistant: Poor Bob has been having a terrible day! Ejected from the shuttle during the crash, he was fortunate enough to be wearing a parachute. Now he's stuck in a tree, about fifty feet off the ground. He would've happily climbed down, but there is a nest of Centaurian Hornets just a few feet from his face. Centaurian hornets are a lot like regular hornets, except that they secrete acid. If the nest is disturbed in any way, the hornets spend 1d3 minutes taking to the air before they begin to devour poor Bob. Should the PC's get in the hornets way (knocking down the nest), they must make Fortitude saving throws (DC 10) each round or take 1d3 damage. Any use of fire or aerosol spray will cause the hornets to flee. Bob is carrying a pair of MRE's (meals ready to eat), a full clip (6 chips) of Pulse Rifle ammo (but no rifle, he dropped it somewhere) and has several hundred feet of parachute cord. If rescued, assign Bob a 0-level character sheet and give him to a member of the party. Guest Host: The guest host of Offworlders is hiding in a cave, scared out of their mind after encountering an angry Gorekillaz. Unfortunately for the guest host, there are more Gorekillaz in the cave. The guest host will fire on anyone that approaches within 30' of the cave entrance unannounced. Once the guest host is convinced to leave the small cave, a Gorekillaz will spring out, killing the host. The Gorekillaz will then retreat back into the cave with the guest host's body. The cave is 5' wide and 30' feet long, ending in a 20' by 20' chamber. 3 more Gorekillaz are hiding in the chamber (for a total of 4). The guest host carries a Pulse Rifle with three chips of ammo (see weapon description.) Feel free to use creative license when choosing a guest host. Perhaps they are a clone of a modern day celebrity! Centigoat Surprise: The PC's come to a small ravine. To get to the other side, the PC's must either climb down (50', only a DC 5 due to the branches and roots) and climb back up on the other side, or spend another hour traveling in either direction to get around the the obstacle (forcing another encounter.) As the PC's climb down, take careful note of their order. Choose the PC with the lowest Luck score. Once they are at the bottom of the ravine, a Centigoat stinger (with a +4 addtional bonus to attack) will strike that PC. If this encounter is rolled again, either with the same ravine (possibly an extension) or another, 2 Centigoats appear at the bottom of the ravine, completely bursting out of the ground and into combat. Searching the ravine reveals all manners of sticks and debris that could potentially be used as clubs, torches, or rather large toothpicks. Worm Pit: The lead PC falls into a 10' deep pit and into a soupy mixture with the texture of bean dip. Immediately the next round, something large and hungry begins nibbling at the PC's legs. The worm attacks each round (Atk +1 melee 1d4 damage), until the PC is pulled out of the pit. The edge of the pit should be approached with caution, as the ground is quite soft. Any PC performing an action at the edge must make a Reflex save (DC 10) or tumble into the soupy mix. Crashed Satellite: The PC's come across an irradiated pool of muck and slime, thirty feet across. There is a faint green glow, and a crashed satellite rests nearby. Radioactive fuel from the satellite has seeped into the pool. Two Mutated Gorekillaz are lay half-in and half-out of the pool, seemingly dead. If approached, these aliens will rise up, revealing terrible mutations and growths, and attack the party. PC's who approach within 5' of the satellite, or enter the pool itself, must make a Fortitude save (DC 15) or take 1d3 points of Stamina damage from the radiation. Salvaging the crashed satellite yields a transmitter that could possibly be used to communicate with the production crew in orbit. A second shuttle can land in the area within 1d14 hours. Rain of Pain: The weather takes a turn for the worse, and a heavy rain starts to fall. The acid content of Centaurus VII's rain isn't deadly, but it is high enough to cause skin reactions and general anxiety. Anyone exposed to the rain must make a Fortitude save (DC 8) each hour or suffer 1 point of Personality damage to reflect agitation. The rain persists for 1d5 hours, possibly through multiple encounters. The Personality damage heals at a rate of 1 point per hour spent under cover or after the rain ceases. The Sezregoat Monolith: The PC's discover the original monolith that allowed Sezregoat to colonize Centaurus VII. A simple, silver 10' cube, the monolith bears a carved seven pointed star of Sezrekan on each side. Judges are encouraged to use this monolith in any way that fits their play style. Perhaps the monolith will summon the Sezregoat (stats found in a previous blog entry.) Perhaps someone who touches the monolith can contact Sezrekan himself and attempt a Patron Bond. Or maybe 1d4 Centigoats arrive to attack the party. C.H.O.P.A. #2 - There are several ways to find the second CHOPA. If they climb to the top of a tree (DC 10), they will see smoke rising from the jungle, about 3 miles to the south of the crashed shuttle. Given the thick foliage, this trek takes 3 hours (thus, 3 jungle encounters.) They can also try to jury-rig a transmitter from the crashed shuttle, CHOPA 1, or the crashed satellite. Allow any PC with a technical occupation to make this attempt (DC 15.) Finally, allow the PC's to get to the CHOPA after 5 total hours wandering in the jungle. Surrounded in Veingrass: Once the PC's arrive at CHOPA 2, they will notice that it is surrounded by a thin, red, spaghetti-like grass. This is veingrass, and anyone who attempts to approach CHOPA 2 will find that the grass will crawl up their legs and try to leech their blood (Atk +0, 1d3 damage.) Placing planks or other pieces of debris atop the grass prevents this effect. Removing the Helium Module: So long as the PC's have a toolkit, removing the Helium Module takes less than 10 minutes. The pod is 50lbs, and long enough to be carried by two PC's. Without the proper tools, the PC's must make a DC 20 Intelligence check to come up with an alternate means of removing the module. Any roll of a 1 causes the module to break, filling the air with helium. Good luck getting off of Centaurus VII now! Trek Back: By this point the PC's are probably fairly banged up from the trek to the pod. Either roll one more time on the Jungle Encounter table, or pick something that you really want to throw at the party. Ascent - With the Helium Module in hand, and CHOPA 1 ready to depart, the PC's must fend off one last wave of Centigoats, or flee during the battle. The Helium Module takes 6 rounds to deploy, -1 round for every PC that does "something" to aid in the process. Perhaps they are at the controls on the inside, or outside trying to help the balloon inflate. Eventually the CHOPA's giant helium balloon rises up past the canopy, and the surviving contestants of Offworlders can "call for evac!" Centigoat Rush: The final Centigoat rush consists of 3 creatures. If your players are doing particularly well feel free to mutate them with dragonfly wings, and a flying speed of 30'. A common theme in sci-fi horror movies is a lack of resources and ammunition. The two weapons featured below have very limited ammunition. This should reflect a 0-level, untrained character pulling the trigger and unloading a half dozen bullets or more with each squeeze. To simulate the scarcity of ammunition for these special weapons, use poker chips as ammo counters. Each time the weapon is used, make the player give back a chip. If you want to be really cruel, whenever they fumble make them give an extra chip! Also, the first player at the table to strap their pulse rifle and flame thrower together "Ripley Style" gets a point of Luck. Pulse Rifle - Damage 1d12, Range 50/100/150, Ammo Capacity 6 chips. Special: Player may choose to spend 2 chips (instead of 1) to increase Action Die by +1d. Flame Thrower - Damage 1d6, Range 30' cone, Ammo Capacity 4 chips. Special: All creatures in the Flame Thrower's range must make a Reflex Save (DC 10) or take damage. Player may choose to spend 2 chips (instead of 1) to increase the DC to 14. Centaurian Gorekillaz - Similar to, but smaller than the Four-armed Ape-Men of other worlds, the Centaurian Gorekillaz would've eventually evolved into civilized beings if their world hadn't become infested with Centigoats. Curious but deadly, Gorekillaz can use simple tools and implements to explore their world. They perceive anything that isn't a member of their pack to be a threat, so it's best to keep them at a safe distance. Init +0; Atk slam +1 melee (1d6); AC 13; HD 1d8+1; MV 40' or climb 20'; Act 1d20 or 2d16 (crits on a "16"); Ref +1, Fort +2, Will -1; SP a Gorekillaz can perform an "intimidating four arm dance of fury" in lieu of attacking, requiring all opponents engaged in melee combat to make a Will save (DC 10) or disengage from combat for 1d3 rounds due to shock and awe. Mutated Gorekillaz - Essentially a regular Gorekillaz who came in contact with radioactive satellite goop. Now it looks more like a zombie. Centigoat - Goats are not native to Centaurus VII. They first arrived on the planet just three hundred years ago, after the great, multi-verse traveling, Headless Goat Dragon Sezregoat* emerged from a great, metallic monolith in the jungle. Sezregoat brought with him several dozen goat minions, but quickly found that the creatures, at least in their native form, could not survive the alien world. So the wise Sezregoat used his great psionic ability to wield the power of dark matter, fusing the goat minions into Centigoats. He also gave them scorpion tails, because that's just how Sezregoat rolls. Centigoats are fearsome creations. They roam the jungles of Centaurus VII hunting for new prey. To look into the eyes of a Centigoat is to see true evil. While Centigoats can no longer create offspring on their own, they have the ability to transform other creatures into Centigoats by injecting them with Centigoat DNA via their vicious scorpion-like tails. One day, all of Centaurus VII will be dominated by Centigoats. Init: +2; Atk ram +2 melee (1d8) or sting +2 melee (special); AC 12; HD 2d8+2; MV 50'; Act 1d20; Ref +2, Fort +2, Will +0; SP organic opponents stung by a Centigoat must make a Fortitude save (DC 12) or be transformed into a Centigoat in 2d7 minutes. This process is really gross, involves lots of phlegm and groaning, and should be described in detail. *The legend of the Sezregoat can be found in a previous blog-entry. While running Tower of the Black Pearl, one of the players placed the ancient brain of Sezrekan on the neck of a headless goat. I ruled that the brain-for-a-head monstrosity grew wings, became a dragon, and named itself "Sezregoat." I didn't expect the creation of the now legendary Headless Goat Dragon Sezregoat. I didn't expect for eight of the PC's, including all of the 2nd level scurvy wastelanders from our first act of Tower of the Black Pearl, to teleport completely out of the adventure mid-session. I didn't expect a near TPK (total party kill) after the remaining 0-level characters slaughtered each other during the last scene in front of the Dragon Statue. I'd like to offer some clarification as to why there are three groups of player characters (PC's) represented in this month's Dramatis Personae. This is a DCCRPG World Tour 2016 campaign, run at our local game club, the Norwin Game Knights. 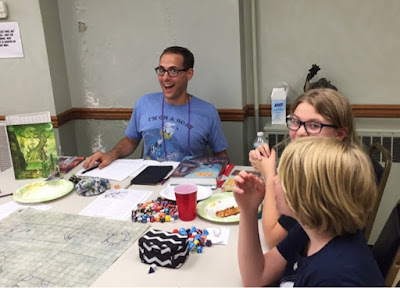 Each month we let new players join in the fun, and frequently we get first time RPG'ers! The first set of characters, we'll call them the "Post-Apocalyptic Time Traveling Buccaneers," (aka, the original "Scurvy Wastelanders") were those present during our last session of this campaign, back in May. The second set, the "Time Travelers in the Egg", represent the new players just joining our Tower of the Black Pearl adventure. Included in this group are a pair of PC's who were in previous campaign play sessions. Something kind of crazy is going to happen in the middle of the adventure, requiring many of the players to take on the roles of 0-level "Lost Pirates." That's the third and final group. After following a blood-magic power portal to a secret, subterranean sea-cove, and defeating a band of humanoid pirates, our scurvy wastelanders are blinded by a brilliant flash. It is a time-traveling egg from the Weird West, piloted by Fenrir the Robot Cleric of Google! Fenrir and Doug the Dwarf bring with them eleven new souls to help their companions complete their quest for the Black Pearl. Two paths lay before the scurvy wastelanders: a natural cave network to the north or a wooden door to the east. The party choses the door and discovers a room covered in runes. Several clay urns rest upon a shelf, and Lord Old Man Legolas of Ikea (LOMLOI) starts breaking them open. Inside are desiccated organs, imbued with strange and alien magic. The scurvy wastelanders begin eating the ancient organs. Hey eats first and grows a face on the back of her head. Fenrir (a robot) eats next, and even though they are not organic, they grow eighteen inches. LOMLOI takes the brain and attaches it to the neck of his trusty headless goat. This is where things go horribly wrong. The headless goat, empowered by the dark magic of Sezrekan's ancient brain, becomes SEZREGOAT, the HEADLESS GOAT DRAGON! The Headless Goat Dragon produces waves of noxious death flatulence that kill several members of the party. Even the legendary LOMLOI is nearly killed by his beloved headless goat's hatred. The scurvy wastelanders battle the dragon, but most of the party are not strong enough to be effective. Everyone turns to LOMLOI to use his magic, so he does the one thing that he believes will save everyone. Lord Old Man Legolas of Ikea invokes his patron: Sezrekan. Instantly LOMLOI and seven other members of the party are teleported elsewhere (313 miles away.) Mikasa, Lucky Svetlana, Namor, and Big Guy are left behind. They run. The fleeing peons run all the way to a boat captained by an undead ferryman. They all pay the ferryman and take a scenic boat ride across an underwater lake to a small beach. On the beach are a bunch of Lost Pirates. They join the rest of the Time Travelers and continue their search for the Black Pearl. Pursued by Sezregoat, the party proceeds through a series of trap laden rooms. A room that floods with water, a trap door, and a very dangerous rope bridge. Five would-be-heroes fall to the traps before the team discovers a great sarcophagus on the opposite side of the rope bridge. The party takes the lid off the sarcophagus, revealing Sezrekan's original body, in mummy form. Toriel tries to take the skull of Sezrekan, but the lord of dark magic forces the tailor's brain to come out of her nose. You Don't Understand Me Mom (Y-DUMM) takes the crown of Sezrekan, but finds all her limbs replaced with tentacles. Finally Legolas Jr. tries to communicate with his grandfather's patron, and the mummy hands over a pair of ruby gems. Knowing that the gems will fill the eye sockets of the blood-magic teleporters at the base of the Tower, and fearing the Sezregoat's pursuit, Legolas Jr. leads the group out of the sarcophagus room through a secret door, and back to the Tower. Taking the ruby-eyed portal at the Tower's base, the team is transported into a long chamber. On the opposite side of a long, water filled room, is a Dragon Statue. In the statue's mouth the Black Pearl! Although a great pool filled with sea snakes separates the party from the statue, Y-DUMM is unharmed as she uses her tentacles to swim to the other side. One by one, the tentacled Goth Wiccan helps her team swim to the other side. This is where things went... awry. Legolas Jr. somehow knows his grandfather's secret, that Sezrekan did not wish for Jack Sparrow to have the Black Pearl. Namor the Atlantean kills Legolas Jr. for being in league with Sezrekan. The entire party erupts in a bitter, inter-part battle that costs the lives of Namor, Gaster Follower #1, and Bernie Sanders. Next, Polar Bear & Jelly (one character, strange name) takes the Black Pearl, causing a great rush of water to spray out, tipping the statue on top of Polar Bear & Jelly, Lucky Svetlana, and Y-DUMM. They all die. As the room continues to flood Mikasa, Garrett Cole, and Bernwald Sandertap flee to the top of the Tower. Captain Jack Sparrow awaits the Black Pearl on board the Black Pearl, but Mikasa crushes it, ending its evil magic. Captain Jack leaves the party behind, but they find the original scurvy wastelanders' dinghy, and sail to shore. LOMLOI, Doug, Lisrayten, Scrooges McDucks IX, Fenrir, Pzarro, Hey, and Napstablook stand on the shuttle deck of the USS Enterprise, three-hundred and thirteen miles above the Tower of the Black Pearl. A team of red shirt security personnel find the scurvy wastelanders. One of them shoots and kills Napstablook. I needed a way to introduce a whole mess of 0-level characters about halfway through Tower of the Black Pearl. If all the players had been brand new, I just would've used 0-level fantasy characters, reskinned as pirates seeking the Black Pearl. Actually, that's the route I'd use later. But two of the players, Alex and Zach, missed the first part of this adventure. I needed to find a way to introduce Fenrir the Robot Cleric and Doug the Dwarf into this game. Hence the time traveling egg! When we last left these two characters, they were in the Weird West. After getting separated from the rest of their party, they came across a time-traveling egg, granted to them by an alien visitor named "Mork." To set the tone for our new DCC players, I made them sacrifice one of their characters as "Hero Fuel" into a giant, 1970's style blender located in the time-traveling egg. This was the only way to make Mork's time machine work. Fargus the Boxer was chosen, but pushed Big Sal the HVAC Repair Man into the blender at the last minute. Bass-O-Matic time! As the party devoured Sezrekan's mummified organs, I made each eater roll on the Major Corruption chart. Small shadow dragon; Init +6; Atk claw +7 melee (1d8); bite +7 melee (1d12); AC 16; HD 6d12 (30 hp); MV 40; Act attacks 2d20, spells 1d20; SP see below; SV Fort +6, Ref +6, Will +6; Al N.
Martial Power 1: Amphibious. The dragon can breathe water and swim effortlessly. Unique Power 1: Corrupt water (at will). The dragon can turn all water within 100’ poisonous (Fort save or lose 1d4 hit points per sip). Unique Power 2: The dragon possesses – and uses – a powerful magical artifact of a design up to the judge. I have no idea where I'm going to go with the next adventure. I'm love to reskin an existing Dungeon Crawl Classics adventure to work on the USS Enterprise. Suggestions? "You name him Bob, it's a death sentence." - Craig. I decided to make him roll a Luck check to see if he wouldn't just die in a dumb way. He failed. "You said when I died, I'd become a god!" - Evan, when he thought Lord Old Man Legolas was going to die. I don't remember making this promise. "Can we use our hero fuel?" - Ethan decides to sacrifice Michael's characters to hold up a door. Bob - Decapitated when a piece of an eggshell fell on his neck.